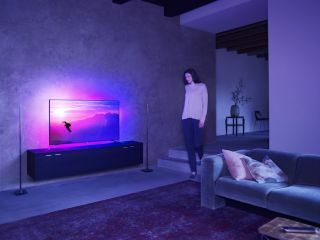 Philips confirms new TVs for 2016 and Amazon Instant Video partnership | What Hi-Fi? Philips will reveal more details about its new 6000 UHD and 7000 UHD series in February, but has already teased some information at CES 2016. The 7000 series will come with three-sided Ambilight technology while the “majority” of the 6000 sets will also get the same treatment. The 7000 series will be HDR-compatible and will serve as Philips’ entry-level range for the picture technology. A new 5000 Full HD series has also been confirmed. These sets will come with “upgraded picture and sound quality” along with an improved Android TV performance. The series will also feature the 5211 24in monitor/TV/Bluetooth speaker in one product. Finally, a 4000 Full HD series will round off the new additions to Philips’ range of 2016 TVs. The new ranges should be available in the first quarter of 2016. Philips has also confirmed the flagship 8601 and 8901 AmbiLux sets - which use projectors rather than LEDs to cast an extended picture onto the wall behind the set - will move from limited to full distribution by mid-January. Amazon Instant Video will launch on the Philips Android TV platform alongside the new ranges and will support both Full HD and 4K Ultra HD streaming to compatible sets.